Heȟáka Sápa (Black Elk) (December 1, 1863 – August 19, 1950) was a famous wičháša wakȟáŋ (medicine man and holy man) and heyoka of the Oglala Lakota (Sioux) who lived in the present-day United States, primarily South Dakota. He was a second cousin of the war leader Crazy Horse. Near the end of his life, Black Elk met with amateur ethnologist John Neihardt and recounted to him his religious vision, events from his life, and details of Lakota culture. Neihardt edited a translated record and published Black Elk Speaks in 1932. The words of Black Elk have since been published in numerous editions, most recently in 2008. There has been great interest in his work among members of the American Indian Movement since the 1970s and by others who have wanted to learn more about a Native American religion. Black Elk's first wife Katie converted to Roman Catholicism, and they had their three children baptized as Catholics. After Katie's death, in 1904 Black Elk, then in his 40s, converted to Catholicism. He also became a catechist, teaching others about Christianity. He married again and had more children with his second wife; they were also baptized and reared as Catholic. He said his children "had to live in this world." In August 2016, the Roman Catholic Diocese of Rapid City opened an official cause for his beatification within the Roman Catholic Church. Black Elk had learned many things in his vision to help heal his people. He had come from a long line of medicine men and healers in his family; his father was a medicine man, as were his paternal uncles. Late in his life as an elder, he relayed to John G. Neihardt the vision that occurred to him. Among other things he saw a great tree that symbolized the life of the earth and all people. Neihardt recorded his account in great detail, later publishing it as Black Elk Speaks. Since the late twentieth century, Black Elk's words have received renewed attention, including from non-Lakota. An annotated edition was published by the State University of New York in 2008. In his vision, Black Elk is taken to the center of the earth, and to the central mountain of the world. Mythologist Joseph Campbell explains this recurring symbol among religions as "the axis mundi, the central point, the pole around which all revolves ... the point where stillness and movement are together ..." Black Elk was residing at the axis of the six sacred directions. Campbell viewed Black Elk's statement as key to understanding myth and symbols. Black Elk had many visions throughout his life, which reinforced what he had seen and felt as a boy. He worked among his people as a healer and medicine man. There was a soldier on the ground and he was still kicking. A Lakota [Sioux] rode up and said to me, ‘Boy, get off and scalp him.’ I got off and started to do it. He had short hair and my knife was not very sharp. He ground his teeth. Then I shot him in the forehead and got his scalp. ... After awhile [on the battlefield] I got tired looking around. I could smell nothing but blood, and I got sick of it. So I went back home with some others. I was not sorry at all. I was a happy boy. In 1887, Black Elk traveled to England with Buffalo Bill's Wild West, an experience he described in chapter twenty of Black Elk Speaks. On May 11, 1887, the troupe put on a command performance for Queen Victoria, whom they called "Grandmother England." Black Elk was among the crowd at her Golden Jubilee. Black Elk participated in the fighting at the Wounded Knee Massacre in 1890. While on horseback, he charged soldiers and helped to rescue some of the wounded. He arrived after many of Spotted Elk's (Big Foot's) band of people had been shot, and he was grazed by a bullet to his hip. For at least a decade, beginning in 1934, Black Elk returned to work related to his performances earlier in life with Buffalo Bill. He organized an Indian show to be held in the sacred Black Hills. But, unlike the Wild West shows, used to glorify Native American warfare, Black Elk created a show to teach tourists about Lakota culture and traditional sacred rituals, including the Sun Dance. Black Elk married his first wife, Katie War Bonnet, in 1892. She converted to Catholicism, and all three of their children were baptized as Catholics. His son, Benjamin Black Elk (1899–1973), became known as the "Fifth Face of Mount Rushmore", posing in the 1950s and 1960s for tourists at the memorial. Benjamin played an uncredited role in the 1962 film How the West Was Won. 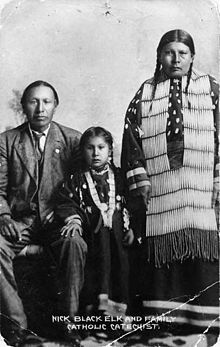 The widower Black Elk married again in 1905 to Anna Brings White, a widow with two daughters. Together they had three more children, whom they also had baptized as Catholic. As he later said, his children had to live in "this world." (See below, account by Hilda Neihardt.) The couple were together until her death in 1941. Black Elk was a leader in the revival of the Sun Dance (an important religious ceremony among several tribes) and its reinstatement in Lakota life. Lakota traditionalists now follow his version of the dance. In the early 1930s, Black Elk revealed the story of his life, and a number of sacred Sioux rituals to John Neihardt and Joseph Epes Brown for publication. Black Elk worked with Neihardt to give a first-hand account of his experiences and that of the Lakota people. His son Ben translated Black Elk's stories into English as he spoke. Neihardt's daughter Enid recorded these accounts. She later arranged them in chronological order for Neihardt's use. Thus the process had many steps and more people than Black Elk and Neihardt were involved in the recounting and recording. After Black Elk told Neihardt his vision over the course of several days, Neihardt asked why Black Elk had "put aside" his old religion. According to [Neihardt's daughter] Hilda, Black Elk replied, "My children had to live in this world." In her 1995 memoir, Hilda Neihardt wrote that just before his death, Black Elk took his pipe and told his daughter Lucy Looks Twice, "The only thing I really believe is the pipe religion." Since the 1970s, the book Black Elk Speaks has become an important source for studying Native spirituality. With the rise of Native American activism, there was increasing interest among many in their traditional religions. Within the American Indian Movement, for instance, Black Elk Speaks was an important source for those seeking religious and spiritual inspiration. They also sought out Black Elk's nephew Frank Fools Crow, also a medicine man, for information on Native traditions. In the same period, there has been rising interest among non-Native Americans in Native culture and religions. On August 11, 2016, the US Board on Geographic Names officially renamed Harney Peak, the highest point in South Dakota, Black Elk Peak in honor of Nicholas Black Elk and in recognition of the significance of the mountain to Native Americans. On October 21, 2017, the cause for canonization for Nicholas Black Elk was formally opened by the Catholic Diocese of Rapid City, South Dakota, paving the way for the possibility of him one day being recognized as a saint. He is now designated as a "Servant of God." His work to share the Gospel with Native and non-Native people and harmonize the faith with Lakota culture were noted at the Mass. The Sixth Grandfather: Black Elk's Teachings Given to John G. Neihardt, edited by Raymond J. DeMallie, University of Nebraska Press; new edition, 1985. ISBN 0-8032-1664-5. Black Elk: Colonialism and Lakota Catholicism, by Damian Costello, Orbis Books; 2005. Black Elk, Lakota Visionary, by Harry Oldmeadow, World Wisdom; 2018. ^ a b c DeMallie, Raymond J., ed. (1985). The Sixth Grandfather: Black Elk's Teachings Given to John G. Neihardt. University of Nebraska Press. p. 47. ISBN 0-8032-6564-6. ^ "1950". Newsaints.faithweb.com. Retrieved 17 April 2018. ^ "Diocese of Rapid City — The Catholic Church of western South Dakota". Diocese of Rapid City. Retrieved 17 April 2018. ^ a b Frazier, Ian (26 December 2017). "Another Vision of Black Elk". Newyorker.com. Retrieved 17 April 2018. ^ a b c d e f g DeMallie, Raymond J (1984). The Sixth Grandfather: Black Elk's teachings given to John G. Neihardt. Lincoln: University of Nebraska Press. ISBN 0-8032-1664-5. ^ Neihardt, John, ed., Black Elk Speaks, annotated edition, published by SUNY, 2008, p. 33. ^ Campbell, Joseph (1991). The Power of Myth (with Bill Moyers). Anchor Books edition (non-illustrated smaller-format edition). p. 111. ISBN 0-385-41886-8. ^ "BBC - Manchester - Features : Tracking the Salford Sioux". Bbc.co.uk. Retrieved 17 April 2018. ^ "Black Elk Speaks : Index". Firstpeople.us. Retrieved 17 April 2018. ^ "When she came to where we were, her wagon stopped and she stood up. Then all those people stood up and roared and bowed to her: "but she bowed to us." Neihardt, John, ed., Black Elk Speaks, annotated edition, published by SUNY, 2008, pp. 176-177. ^ John Gneisenau Neihardt (1985). The Sixth Grandfather: Black Elk's Teachings Given to John G. Neihardt. University of Nebraska Press. pp. 274–. ISBN 0-8032-6564-6. ^ John G. Neihardt (1 August 2008). Black Elk Speaks: Being the Life Story of a Holy Man of the Oglala Sioux. SUNY Press. p. 313. ISBN 978-1-4384-2538-2. Retrieved 24 February 2013. ^ Kilen Ode, Jeanne (1984). Dakota Images: Benjamin Black Elk (PDF). 14. South Dakota Historical Society. ^ a b Mails, Thomas E. (1979). Fools Crow. Garden City, NJ: Doubleday. ISBN 0385113323. ^ a b c Clyde Holler (2000). The Black Elk Reader. Syracuse University Press. pp. 39–43. ISBN 978-0-8156-2836-1. Retrieved 24 February 2013. ^ Neihardt, Hilda (1999) [First published 1995]. Black Elk & Flaming Rainbow: Personal Memories of the Lakota Holy Man and John Neihardt. University of Nebraska Press. p. 119. ISBN 0-8032-3338-8. ^ "Cause Opens for Nicholas Black Elk, Holy Man of the Lakota". Ncregister.com. Retrieved 17 April 2018. ^ "Canonization process begins for Black Elk, the Native American who merged Lakota and Catholic culture". Americanmagazine.org. 3 November 2017. Retrieved 17 April 2018.